Most people think of a car battery only as the thing that starts their vehicle. Of course, the battery’s main purpose is to reliably start the vehicle under a variety of operating conditions, but a car battery does much more than that. Let’s take a closer look. Preserving the life of the alternator: The battery must be able to accept a charge from the alternator. In other words, the battery must be able to “recover” its voltage (usually around 12.6 volts) after the engine starts. If there’s a problem with the battery’s chemistry or its internal components, it may not be able to accept a charge from the alternator. This reduces voltage recovery and limits the battery’s ability to start the car. However, a battery’s ability to accept a charge from the alternator also affects the health and functioning of the alternator itself. If the internal resistance of the battery changes too much, it can cause the alternator to work too hard, thus reducing its overall life expectancy. Filling in for the alternator: The battery must provide power when the alternator isn’t the main source of energy. When the engine is running, the alternator is the electrical supply source for the vehicle. When the engine isn’t running, however, the battery itself must serve as the main power source. This is why sitting in your car for too long while running the lights or the radio—even with the engine off— can kill your battery. 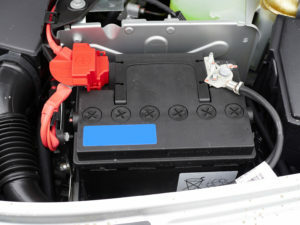 Data preservation: When the vehicle is not running, the battery supplies current to the microprocessors (or computer modules) that are constantly working behind the scenes. These microprocessors gather data that supports computer memory for the engine and transmission control modules, among other things. All of this data—including data for less important functions like radio presets and seat position memory—can be lost in the event of a main power failure, and the battery helps to prevent this. Electrical equilibrium: The battery acts as a kind of electrical filter, helping to manage amperage levels that can range from milliamps to brief spikes of hundreds of amps. In addition, voltage spikes can occur when certain components cycle on and off, so the battery must help absorb these spikes to prevent both damage to, and interference with, vital electrical components. Guiding the charging system: In newer vehicles, the alternator output is usually controlled by the power-train or engine control module. The module in charge of regulating or controlling charging voltage uses data gathered from the battery and other sensors to strategically adjust charging voltage. This helps to prevent over- or under-charging, and increases fuel economy by reducing the alternator duty cycle when the electrical demand is lower. Acting as a supplemental power source: The alternator can become overwhelmed when electrical demand surpasses the alternator’s electrical output capacity, usually due to simultaneous use of multiple high-current consumers. For example, if you’re driving in snowy conditions, you might be using your fog lights, rear defroster, blower motor, and windshield wipers at the same time, all while running the vehicle at lower speeds, which can put major stress on the alternator. Installation of high-current consuming aftermarket audio equipment—such as amplifiers and subwoofers—can cause similar problems. In these situations, the battery must be recruited as an extra power source. 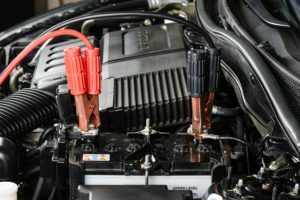 Even then, both the life of the battery and the alternator can be significantly shortened if the vehicle operates under these conditions for extended periods. As you can see, the humble battery is more than just a glorified “on” switch; it plays a central role in many aspects of a vehicle’s intricate electrical system. Having your battery (and alternator) checked regularly, and being mindful of how you are using them, can help prevent larger issues in the future. Thinking it might be time to give your battery a checkup? Contact us today to schedule your inspection. To be honest I couldn’t fault her logic. In most drivers’ minds, if the check engine or service engine soon lights are not on, then there is not a problem. As someone in the industry, I know that it is not that simple. I drive a 2000 Honda Accord that my wife and I bought new. As a vehicle inspector, most of my days are spent going to dealerships and repair facilities all over Central North Carolina and Southern Virginia. With the amount of time that I spend on the road, it’s relatively easy for me to rack up the miles on my vehicle. 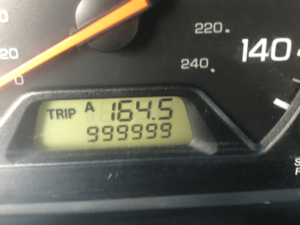 There are currently over 1,000,000 miles on my car. 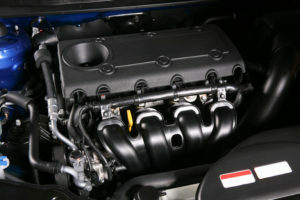 Even with my experience, I have no idea if my engine and its ancillary components are behaving like Honda’s engineers intended unless I connect some sort of diagnostic equipment to the vehicle. Having access to this equipment makes it easy for me to get a snapshot of the current condition of my engine and its management system. On average, I fill up three to four times a week, so it’s easy to understand why I am big on making sure my engine and fuel management systems are running at an optimal level. I usually do an engine performance check on my car about once every other month, just to make sure everything is operating as it should be. Of course, this would be overkill for the average driver. Since I have access to the equipment, though, it’s relatively easy for me to check my car for any performance or fuel efficiency issues. As I mentioned earlier, gas mileage per tank of fuel is really important to me. My Accord consistently gets between 440 and 460 miles out of a 15 gallon tank. That’s basically around 30 miles per gallon. When my fuel mileage drops under 440 miles per tank, I can usually trace the excessive fuel consumption back to the way I was driving, the topography, climate, etc. If the fuel efficiency drop is even more noticeable, I will take a closer to look to see if there is anything out of the ordinary going on. The last two times my fuel economy dropped drastically, the culprits were mis-calibrated and lazy oxygen sensors, and a failing torque converter. 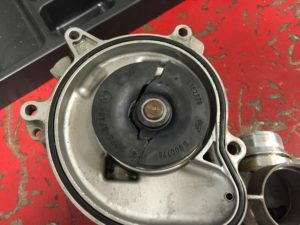 The torque converter had an effect of roughly twenty five miles per tank, while the oxygen sensors decreased fuel efficiency by closer to thirty miles per tank of fuel. The oxygen sensors were relatively easy to fix, while the torque converter was considerably more expensive. Most drivers may not be aware of a problem until there are obvious issues like a lack of power, sluggishness, higher than normal fuel consumption, or the dreaded check engine light that we mentioned earlier. Making it even more challenging, many newer cars are able to cover up and mask certain issues if a sensor, actuator or other component is approaching the lower or upper boundaries of their operating parameters. Said another way, modern vehicles are so good at compensating for problems with engine management system components that a change in idle quality and engine performance may not be easily noticeable. By the way, most technicians will not check for potential engine performance problems unless the customer brings it to their attention. The free inspection that most repair facilities offer is a usually a visual inspection of the vehicle’s undercarriage, tires, engine compartment, etc. Just because a warning light is not illuminated doesn’t mean everything is copacetic. Without making this post too technical, we need to understand why the check engine light is activated in the first place. The main reason that the engine’s computer decides to turn on the check engine light is for a real or perceived increase in engine related emissions. In simple terms, all manufacturers want the air coming into the engine to mix with the correct amount of fuel and efficiently burn that air/fuel mixture. When this happens, the exhaust makeup will be mainly water, carbon dioxide, and small amounts of oxygen, carbon monoxide and unburned fuel. The catalytic converter is in place to reduce the harmful emissions (carbon monoxide, unburned fuel, oxides of nitrogen) even further. If a sensor, actuator or other engine management system component is not working as the manufacturer intended, then the air and fuel mixture will not burn completely and emissions levels will increase. In this scenario, engine performance and fuel efficiency can also suffer. Depending on how much a person drives, the mileage and the age of the vehicle, my advice to motorists would be to have your vehicle checked out at least once or twice a year. For example, this could be when the vehicle is brought in for routine maintenance or, right before a road trip. As I mentioned earlier, a technician will typically not check for performance or fuel efficiency issues unless it is mentioned by the customer. Also, keep an eye on how many miles you typically go between having to refuel. Know what is “normal” for your vehicle. 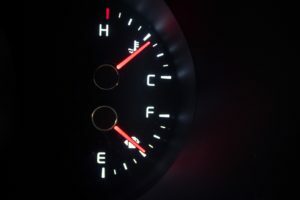 If there is a noticeable drop in fuel economy, then this is a good indicator that a closer look at the engine management system would be in order. Taking these basic steps before you see a dreaded check engine light on your dashboard can help prevent seeing the light at all, and extend the life of your investment. If you have concerns about your fuel efficiency or engine performance, contact me so we can discuss how I can help. Several times a month, we get calls regarding vehicles that will not start. The symptoms range from a clicking noise when cranking to an engine that makes no sounds at all. The driver usually explains that the problem seems to have come from out of nowhere, or that their car won’t crank after several days of inactivity. There are several possible root causes of this problem, all of which relate to the vehicle’s battery. Infrequent use or overcharging causes abnormal voltage levels, which can make it much harder for a car battery to function properly. When a technician receives a repair request for a vehicle that won’t start, usually the first task is to test the battery’s state of charge. Normal battery voltage should be around 12.6 volts. Any voltage reading under 12.5 volts will raise an eyebrow, and a voltage reading significantly higher than 12.6 volts may indicate the charging system is overcharging the battery. A recently-driven vehicle’s battery voltage might be a little higher due to what’s called a surface charge, which can cause a reading that is a couple tenths of a volt above normal. However, if the voltage is noticeably above that, it indicates a potential problem with the charging system. A battery can also experience a certain degree of “self-discharge,” which means that it isn’t recharged frequently enough and will eventually lose some of its stored energy. Battery age can reduce the “standby” length prior to a failure to start. If the vehicle hasn’t been driven for four or five days, you can expect the voltage readings to be low. Voltage loss will be determined by the number of components the battery is supplying power to, its age and internal condition, ambient temperature, and how long the vehicle has been sitting. However, a charger at the correct setting can usually bring the battery back to life. Deep discharging, which happens when the state of charge is below 10.5 volts for an extended period of time, usually causes sulfating, or the accumulation and growth of lead sulfate crystals on the battery plates. In simplistic terms, if a battery stays in a discharged state for too long any crystals that have formed under normal operating conditions will eventually combine to form larger crystals, which makes recharging even more difficult. Severe crystal formation eventually leads to a reduction of negative and positive plate capacity, which will one day lead to battery failure. In addition, when your engine is off, the battery must provide all the necessary energy to power auxiliary functions such as interior lights, audio equipment, windows, door locks, etc. Leaving these components running for too long can deplete the battery’s state of charge and send you scrambling for your roadside assistance card. Climate significantly affects battery life. In the Southeast, battery life averages three to four years, but in some areas of the country—including parts of the Midwest and Northeast—a battery may last for over five years. In other words, increased exposure to excessive heat or cold (especially heat) reduces the life expectancy of a battery by increasing the intensity of what’s referred to as thermal cycling. The plates in the battery expand slightly when exposed to heat and contract slightly when exposed to colder temperatures. Over hundreds of cycles, this can warp the battery plates. Extremely hot climates reduces battery life even further, to an average life expectancy of (approx.) 30 months. It’s especially important to keep track of your battery’s age in such climates. Battery failure is often unpredictable under these conditions. 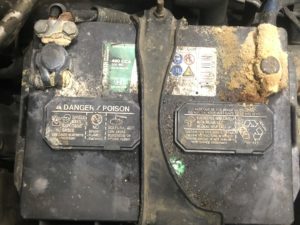 If a battery is not secured properly in its housing (for example, due to a loose or missing hold-down clamp), the excessive movement and vibration that it is subjected to can cause the material on the battery plates to flake off, compromising the battery’s ability to function properly. Battery failure is frequently caused by loss of the water required to maintain normal discharging and recharging functions. In fact, water loss due to high ambient temperatures, hotter under-hood conditions, poor maintenance, and overcharging causes a good number of battery failures each year. 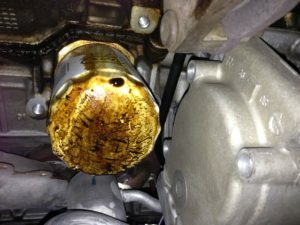 Corrosion and oxidation of battery posts and terminals can be a big problem. The gasses that escape the battery case when recharging is a major contributor to corrosion and acid formation. Dissimilar metals (battery posts, terminals and copper wiring) can also accelerate corrosion and acid build up. Corrosion is a poor conductor of electricity, because it increases circuit resistance, which in turn can have an effect on starting and charging. This list isn’t exhaustive, of course. There are many other causes of battery failure, and some batteries are simply faulty, failing well before the end of their warranty despite proper care. However, the vast majority of the time, you can get the maximum value out of your battery’s life by taking some common-sense precautions to protect it from environmental, electrical, and physical damage. If you’re concerned about the condition of your battery, contact us to schedule an inspection.